We are excited to present this action/drama hybrid score by composer Edwin Wendler. The movie (recently released on BD and DVD) is about two doctors (C. Thomas Howell, Anora Lyn) who volunteer at a clinic in Thailand. One of them gets kidnapped and plans a daring escape with a fellow captive (John Rhys-Davies). 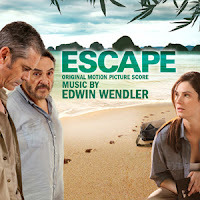 Wendler combines sweeping orchestral themes with exciting chase music featuring ethnic percussion. The main theme is among Wendler's very best so far. The City of Prague Philharmonic is conducted by Nic Raine. Produced by Edwin Wendler and Robin Esterhammer, with special thanks to producer James Chankin. 5/5 I was recently introduced to this score and I was just entertained... when I find I listen to a score twice and like this one three times. I just have to share it, stop back soon and there will be more to share.